After 25 years producing promotional videos and communication products David Delouchery of Hawkeye Films is headed in a new direction. 20 years ago when Mr. Delouchery bought his first professional video camera, a Sony Betacam-SP for $16,000 he considered himself a “big fish in a small pond”. “There were only a handful of serious players in town providing video services to the business market in those days. I had working relationships with most of the production companies in town and I provided shooting and editing services for a number of them including Advanced Video Techniques, Memory Tree, C to C Productions, Gecko Communications, Fred Smith Studios as well as others. When I wasn't using my Betacam-SP video camera, I rented it along with lighting and other production gear to qualified producers.” Large national and global customers that Mr. Delouchery has had the opportunity to produce videos over the years for include: Automation Tooling Systems, Home Hardware, M&M Meat Shops, Linamar, Manulife, Roadtrek, Toshiba Medical Canada. “In 2001, I became the principal shooter/editor at Waxworks Creative. Back in 1996 when I first started working for Waxworks they were the premier production company in town. Over the past 20 years I've had a number of great experiences and stuffed a number of feathers in my cap working for them.” But there is a season for everything and he felt the call to go independent again. The marketplace has changed quite a bit in the past few decades. Now there are a number of new production companies in town and the competition has increased. For producers, it’s no longer necessary to invest in a $15-20,000 video camera. The DSLR video movement revolutionized the look and cost of capturing video. New producers are able to buy gear to produce high quality videos for as little as $5000, including the editing and other necessary pieces of equipment. You can still easily spend $20,000 to $50,000 or more to buy quality tools of the trade but the start up price isn't as expensive and gated anymore. “I was pretty insulated from that competition over the past 15 years.” With the advent of YouTube and the development of the local tech industry there is an increased need for rich media content but now that the tools are so accessible, many “Start-ups” can take the DIY approach and bypass the need for professional storytellers to develop their video marketing materials. 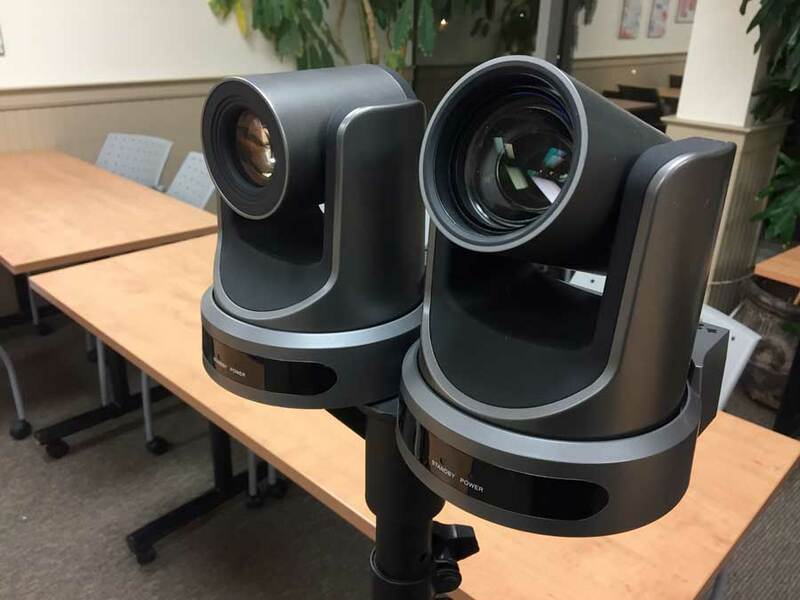 "So the whole time I was taping that event with the single camera I was wondering if it was possible to build a multiple camera system that could be live switched without investing $50-$100,000+. Watching video from the vantage point of one camera angle can become tedious very fast and editing multiple camera angles together after the fact can be very time consuming and expensive for the customer. Switching the cameras live during the event is much more efficient. What I have built is a system that works much like a live news studio or sports broadcast. I can mix up to 8 camera signals, audio feed and on-screen computer graphics into a final program, live, as it happens. The final video is basically complete at the end of the event with very little or no additions to be made in editing afterwards. In addition, mixing the cameras live allows for a dynamic program that can be streamed over the Internet in real time.” Companies that are looking to communicate with remote satellite locations or broadcast a product launch can do so just like Apple or other big brands when they want to share with a local and global audience at the same time. One camera can be on the presenter close-up, another can capture the action in a wider frame that creates interest and yet another camera can grab audience shots to convey context and a sense of space and reaction to the message which allows the on-line viewer to feel as though they are there in the same environment, not missing a thing. In fact just like sports event coverage, they get a front row seat to the action if not better. In addition to the action on stage, the presenter’s PowerPoint feed can be mixed in as well. Depending on the type of event, I can operate all the cameras remotely from my operator station thus reducing the cost of production even further for the customer. “Most of the events I have captured so far have been relatively static affairs with presenters at a podium or seated/stationary performers. A few of my cameras are remote controlled and I can zoom in and change the shot as required from my “control room”. Dynamic and faster paced events like sports and dance usually require a few additional camera operators which increases the cost of production. Despite that Mr. Delouchery has developed a very affordable service that is significantly more cost effective than traditional video production. 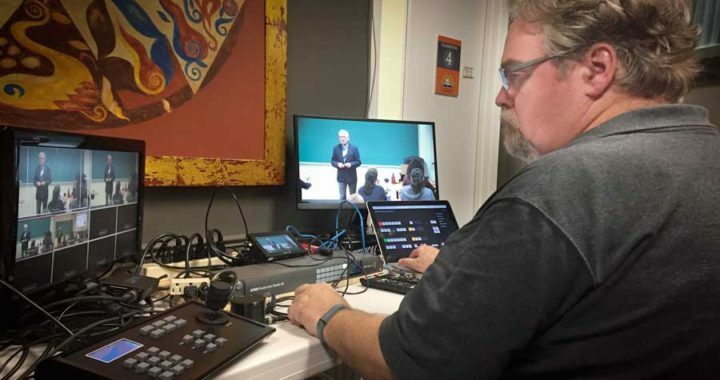 “Without the need for editing and post-production, multiple thousands of dollars are cut from the cost of capturing and delivering an event to the client. In the meantime, Hawkeye Films continues to offer story-telling video production services, as well as commercial photography, Website design, graphics & print design and the new multi-camera live switched, streaming and video presentation service. “I recently completed a 40 minute point of sale DVD presentation for the Historical Construction Equipment Association of Canada. They restore, display and operate old construction equipment at the Simcoe County Museum outside of Barrie as well as at various fairs throughout Ontario. It’s been 10 years since I produced their first video and they called again looking for an update. It was a project I could really get behind due to my love for preserving history as well as appreciating their passion and enthusiasm for their hobby.